Turn Back The Hands Of Time With Complexion MD. Due to constant developments in technology, skincare companies are coming out with new, breakthrough discoveries on an almost daily basis. New combinations of peptides, botanical extracts, and skin nourishing moisturizers are helping millions of women all over the world look as young on the outside as they feel on the inside. And if you're in the market for a beauty cream that helps your outward appearance reflect who you really are, then you might want to give Complexion MD a try. Make sure to thoroughly clean and dry skin prior to use. Apply a dime-sized amount of Complexion MD to your face twice daily, using small circular motions to massage the cream into your skin. For best results, use Complexion MD in conjunction with a microdermabrasion product twice a week. Peptides are a popular ingredient in beauty creams, and have been for decades. Their popularity has a lot to do with how we believe wrinkles form. The reigning theory is that, time and environmental factors may dry out and damage the skin. This dryness and damage ends up appearing on your face as wrinkles and other unsightly blemishes. But it doesn't have to be this way. Peptides are believed to help promote the appearance of smooth, younger-looking skin. The powerful blend of peptides in Complexion MD may help your skin appear firmer and tighter, imbued with a healthy, youthful glow. When it comes to preventing your skin from looking aged, moisture is a girl's best friend (and everyone's best friend, for that matter). Dry skin is said to be one of the leading causes of wrinkles. So if you want to protect your skin from dryness and blemishes, then you want to look for products with natural moisturizers in them. 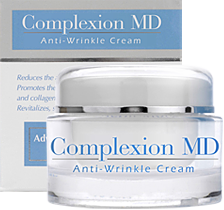 Complexion MD helps you meet your skin hydration needs with a mix of popular natural moisturizers. Shea butter and aloe vera extracts, which are a part of the formula, have been used in moisturizing creams and lotions for many years. Some people even like using them individually - but putting them together has the potential to double-down on their moisturizing qualities. When you aren't exfoliating your skin on a regular basis, your skin can look old, wrinkled, and blemished even though it really isn't. Allowing layers of dead skin accumulate on your face can dull your complexion. They also have the potential to clump up around fine lines, making nearly invisible blemishes more pronounced. Applying vitamins to your skin, especially Vitamin A (retinyl palmitate) may help the natural exfoliation process. That way, the face you put forward when you go out into the world will be the freshest, most youthful one possible.